So. Just read this from a fabulous brand new YA author. I was so excited when I saw this on the shelf of our local independent bookstore! I could remember insisting that my parents read the story of Mike and his anthropomorphic steam shovel repeatedly, sometimes multiple times on the same night. So I grabbed a copy and raced home, eagerly anticipating the look of delight on my children’s faces when they got to experience it. Well, guess what. Turns out that this book is all about the destruction of the environment. Mike and his steam shovel Mary Anne plow over forests, lakes, you name it…all in the name of progress! While this was perfectly acceptable at the time it was written, the illustrations of Mary Anne churning up a gorgeous landscape definitely feels painfully dated. They literally pave over paradise and put in a parking lot. My preschoolers were understandably horrified. The book ended up in the donation box. I had very distinct memories of certain parts of this story. The boy drank coffee for breakfast! His friend Leslie is the fastest kid in school, even though she’s a girl! All of that stayed with me for decades, delivering a warm fuzzy whenever I heard the title. Sadly, I’d managed to block out the ending entirely. Spoiler alert: Leslie dies. And not in any earned way, or even to advance the plot. It’s a pointless death that, worse yet, happens offscreen. And it’s also implied that her death is the main character’s (Jess’s) fault. I had no answer. Mind you, this isn’t the first book we’ve read where an important character experiences an untimely demise: The One and Only Ivan, the Harry Potter books…we’ve navigated all of those brushes with mortality, because there was generally a solid reason the character didn’t make it. But here, the lesson seemed to be, “Hey kids, life is sometimes random and cruel, and you could die at any moment if you dare to play outside by yourself.” Not exactly what I’d been hoping to impart. I know, I know…But before you protest, I’m going to ask: have you read this book as an adult? Because if you haven’t, I can assure you that it simply is not very good. And that broke my heart. I’d always listed this as my all-time favorite book from when I was a kid. I bought the t-shirt from Out of Print. I purchased the set when my kids were still too young for them, just because I was so excited to find a collector’s edition. And guess what? A Wrinkle in Time is actually terrible. Really, really bad, and riddled with novice author mistakes. There are scenes with four or five characters in the room, but only two of them speaking; the others’ presence is not even mentioned for quite literally pages. The plot is slow, ponderous, and poorly explained. The character’s motivations are at best unclear, and at times inexplicable. Halfway through the book, my kids quite seriously asked, “Were all books boring when you were our age?” And I couldn’t fault them for it. Because, aside from a (very) few exciting moments, most of the story meanders along without making any forward progress. Mind you, there are books that hold up well. The Phantom Tollbooth is still wonderfully inventive and charming. Tuck Everlasting sparked an interesting conversation about whether or not it would be cool to live forever (surprisingly, my kids decided “not cool for them, but okay for our cat,” because they can’t bear the thought of him dying). The Lion, The Witch, and the Wardrobe was a bit messier than I remembered, but they enjoyed it. And of course, everything by Roald Dahl is still genius. As the debut author of an upper middle grade book, part of me dreads the day that my children read The Other Boy to their own children. Will the story of Shane stand the test of time? I hope so, but it’s impossible to know for certain. I’d love to hear which books from your childhood held up well, and which…not so much. HANK PHILLIPPI RYAN: First, congratulations for the amazing reviews of THE OTHER BOY. Hurray! But wait, I loved Wrinkle. Didn’t I? And I loved the Edward Eager books, but think they hold up. Don’t they? I do NOT like the Little Princess. SO depressing! But I know Hallie disagrees. But I’ve got to tell you—you know that Shel Silverstein book The Giving Tree? That is so distressing I can’t even imagine what the point was. In fact, I have a next door neighbor who read it when she was seven. She cried for THREE WEEKS. I am not exaggerating. Her mother told me not to say the word “tree,” because it would set her off again. Reds and Readers: How about you? And M.G. 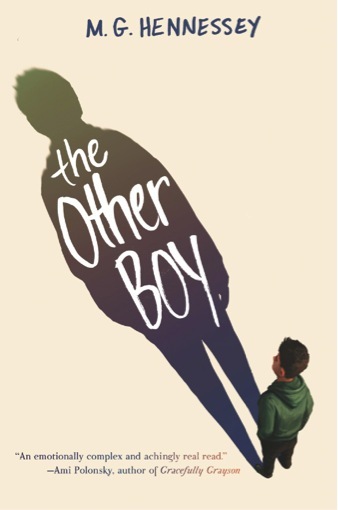 is giving a copy of THE OTHER BOY to one lucky commenter! And please, take a moment to check out M. G.’s groundbreaking and heart-touching new book. We are so pleased the author is joining us today. Congratulations on your book, M.G. . . . and on the lovely reviews! Favorite childhood books? Oh, my, impossible to pick just one. These books, and so many more, read to my children and to each year’s first grade classes. Books are treasures indeed. Blueberries for Sal . . . Corduroy . . . The Rainbow Fish . . . The Snow Day . . . The Polar Express . . . Swimmy . . . The Paper Bag Princess . . . cue the cheering when Princess Elizabeth sends the ignoble Prince Ronald packing. The Lorax . . . I love the idea that someone will speak for the trees. Alexander and the Terrible, Horrible, No Good, Very Bad Day --- everyone in my family knows exactly what I mean when I say I’m having an Alexander day . . . . Interesting topic, M.G., and congratulations on publishing "The Other Boy". Favourite childhood books that hold up well? "The Little Prince" by Antoine de Saint-Expeury and "Anne of Green Gables" by L.M. Montgomery also are classic books that endure. "The Little House on the Prairie" series of books by Laura Ingalls Wilder. I want to be very careful that this post does not turn into an 18 page essay. Children's and YA lit were my field of expertise. My childhood favorites: Fog Magic/Stuart Little/all the Lang Fairy Tale Series/The Oz books, and Thidwick the Big Hearted Moose. When I was a child YA literature did not exist. Congratulations on contributing to this vital part of literature. YA books serve as the bridge to the adult reader. A word about Wrinkle. L"Engle's themes were conformity vs freedom of thought. Meg was a teen protagonist/heroine very unusual for that time. L'Engle used humor (the opening "It was a dark and stormy night" winks to the adult reader.Like Cynthia Rylant who came after, L"Engle is a faith based writer, promoting values of kindness, charity and universal understanding. 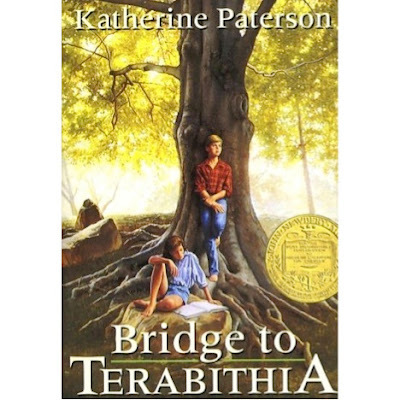 In Terabithia it was the author's intent to show that death can be unexpected. This was one of the early novels to discuss death from a child's POV. Here in my opinion, the author is writing both to the child and to the parent. The book serves as a catalyst for discussion on life and death. Sidebar: this was a Newbery winner. In my opinion the Newbery themes speak more to adults than to children. I have tremendous admiration for an author that tackles the YA audience. The adolescent looking at the challenges of fitting into society while maintaining a sense of inner validity, can be helped immensely by a well crafted role model. Harry, Hermoine, and Ron, have joined Dorothy Gale, Holden Caulfied, and yes Romeo and Juliet as spoke persons for their generation. Finally as we know classic literature must stand the test of time. Will Terabithia be around in 100 years? Probably not. Wrinkle.. nope The other boy? Hope so. The Land of the Lost, East of the Sun, West of the Moon. The Twenty-One Balloons when I was a bit older. I certainly hope that The Other Boy will endure, although I also hope that a hundred years from now my main character would have a much more accepting world to navigate! What else does hold up? My favorite favorite--Many Moons by James Thurber. Do you know it? It is charming and funny and touching and hilarious. 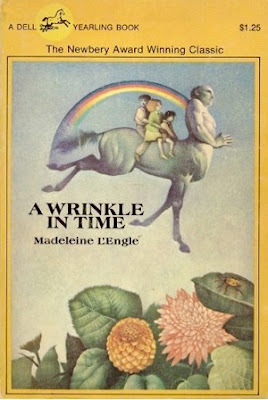 Loved Wrinkle in Time and all the L'Engle books. My 11-year-old son is reading them all (and loving them) now. Loved The Secret Garden and A Little Princess, Anne of Green Gables, the Lloyd Alexander books and the George MacDonald books. I loved the Oz books (all of them by L. Frank Baum - not so much the later ones by family members). And the first one, The Wizard of Oz, holds up... mostly. And of course I LOVED and still do The Little Princess. Anne of Green Gables held up when I read it to my daughter a few (ahem) years ago. And I know Charlotte's Web is still lovely. Now I'm afraid to reread A Wrinkle in Time. What about A Swiftly Tilting Planet? Oh yes, all of EB White's books are wonderful. We listened to THE TRUMPET OF THE SWAN on many long car trips. I also loved THE WOLVES OF WILLOUGHBY CHASE (so did my daughter), CADDIE WOODLAWN, NARNIA, THE PINK MOTEL, NANCY DREW, CHERRY AMES... many more. Now I'm afraid to go back and read! congratulations MG--please tell us more about your book! Where The Wild Things Are was my favorite book growing up, and I think that it still resonates for children today. But of course, it is a few stages before the books we are discussing here. I loved Bridge to Terabithia as well. Did that death have an impact on me in my later life - certainly. The fact is that sometimes people do die who should not have. I haven't read it in a while, and likely there are issues with it. But I think the random nature of the world is an important lesson for children. I've always been reluctant to go back to read Encyclopedia Brown. He was my entree into the crime fiction world, and I don't want to be disappointed or ruin those "memories." And Wrinkle was fabulous in that it showed it was okay to be smart and different- it was a real reassuance for me. But then I am not a contemporary pre-teen. They have new eyes--and that's why this is all so intriguing. Why must we put down the work of others? Writing is hard enough — I dislike reading about books being slammed, especially without any generosity of spirit or a baseline of respect. Really, denigrating the work of other writers just isn't a good look and I'm surprised to see it on Jungle Reds. We're usually a positive and supportive bunch. My you people make me feel old. So many of the books you mention are those I read to my children and grandchildren. My own childhood reading was guided a lot by my father and was very heavy on the classics, Dickens, Twain, Alcott, Verne, Kipling, Carroll, Milne, Stephenson, et al. The Secret Garden was a another favorite, read and reread, but my first books that came to mind were a matched set of the brothers Grimm and Hans Christian Andersen. They were beautifully bound, one in dark green and one in maroon, had edges that had to be cut, and were full of color plates. They were full of gore and sexism, you name it. My children also read them until they disintegrated. I remember reading The Jungle Books to my three year old son. When I stopped for breath, he said "Say more of the pretty words Mommy." Now he writes his own books. My grandchildren have books but all of them, from three to twenty-six, also read on the computer. I suppose MY grandmother learned to read and write on a slate. I had to learn to cut the edges. Time marches on, whether we like or not. I still loved A Wrinkle in Time.....and so many authors have cited that book as the book that got them hooked on reading or made them want to write. I've heard it referenced many times at book festival or writing conferences , by authors on panels. I read it, the first time at about age 6 or 7, and I think it was a bit over my head, so I bought it and read it a few years ago. ( yes, I'm an adult...have been for a long time.) I still love it, and you can't take it away from me. Which is the great part, right? What touches each of us is different--I'm with you on Wrinkle in Time. SO pivotal for me! And have you read The Diamond in the Window by Jane Langton? Amazing! If you haven't , Wrinkle in Time fans, please do! I still think about it! Susan -- has Mattie read it? I'll send it to him! Thanks, Hank. No, Kiddo is all about the Chris Colfer books now. LOVES them. OBSESSED with them. A mom's dream come true to see him so engaged in reading. Susan, has Mattie discovered the Percy Jackson books yet? My grandson was obsessed with those, and he's amazingly well-versed in the mythological gods and goddesses because of them. I'm not the person to ask, being an indiscriminate reader most of my life; it's why I can't write reviews. Unless a book is very, very good or horrible (and I can usually find some aspect of the book that is redeemable) I will finish reading it. (This does not apply to long-standing favorite series or authors, by the way.) But also, don't you find that you forget? I'm always surprised by people who can quote lengthy passages of weighty tomes; once I close a book it's on to the next one, and I put the last one out of my mind. So a memory of a good read may actually have very little to do with the book itself, but more with the time and place where I read it. We still have hundreds of kids' books here, although one daughter shoved a couple shelves full into some donation boxes when I wasn't looking, so we're missing some old favorites. How did I miss reading any Madeline L'Engle? Maybe because science fiction is my least favorite genre. Jane, make no apologies for your favorite books, I say! To Susan's point, I will speak of books that I recommended to The Girl that I loved, but she had a different reaction to (The Boy, unfortunately, is not a reader, although I did read all of the Rick Riordan books when he was in middle school). Nancy Drew - she found the originals too "dated" to be able to relate to the references. But she saw a movie and was updated and we found some books that were more 80s references than 50s. Those she liked. She liked the characters of Nancy, George, and Bess. What stood in her way (originally) was the historical aspect. Once she got a bit older, it was less of an issue. Surprisingly, she connected with A Wrinkle in Time perhaps more than I did - and I was the "different" kid in school. So was she and perhaps that is why. She read Bridge to Terabithia liked it - and bawled at the ending. And I had nothing for her except, "That's the point. Sometimes people die for no 'good' reason." She was "meh" on C.S. Lewis - which I love and reread periodically - except for The Lion, The Witch and the Wardrobe. Dr. Seuss - everything that man wrote was a huge hit with both of us. And of course we both loved Harry Potter. I think sometimes books were written as typical of their times, with time-related references and styles. I think kids' books these days are much faster-paced and that's what middle-schoolers/YA have come to expect. So when they pick up YA books that are now "historical," it can be hard for them to get past the stylistic differences to reach the themes that transcend time (because really - being the "different" kid is the same now as it was 30 years ago, technological means of making that kid feel different aside). Karen, yes! All of the Half-Blood books by Rick Riordan! Sparked a great interest in Greek mythology, which continues to this day! Mary-- that is so fascinating ! Love to hear what the kids think! I mean-- it's so unpredictable. Mary, that's so funny about the Nancy Drew books being dated. They were dated when I read them as a child, and I read them in the late 50's. But that was something I loved about them, the references to "roadsters", etc. I suspect Zak would really enjoy The Other Boy, too. Thanks for the suggestion. I'm always looking for new books and authors for him, since he reads so avidly. Rick Riordan's first set of books--a sweet memory of my youngest nephew--angry at me at bedtime--went into his room, got into his jammies, sat quietly in his rocker reading a few chapters of his current RR book until he calmed down--then off to bed. Just to see him so engrossed in his book--love love love it! I love the sound of this book!! Thank you for writing it. I recently read "Wonder" -- there are great YA books out these days. My FAVORITE book when I was a kid was Louisa May Alcott's "Jack and Jill." Re-reading it takes me right back to when I was engrossed in that world as a little girl. When I was teaching Middle School, I would often have parents push me to include more "classics" -- they would bring me the books and I would be horrified by the racism, etc. Sometimes there are teaching moments, and I fully support BANNED BOOK WEEK, but some older stories are not worth revisiting. Hank - it took her a few years to simply get beyond "ick" but once she figured out how to articulate what didn't work for her in a book, yes, it was a pretty interesting discussion. Then again, she's a very articulate child. And yes, when I read Nancy in the 80s, I suppose it was "dated." But somehow it didn't bother me. The Boy really got interested in Greek/Roman/Egyptian mythology from the Riordan books. I bought him the last one, the first in the Norse series. I don't remember if he connected with that as much. Oh! The Boy also read Ridley Pearson's first about the kids at Disney. I'm forgetting the name. Anyone? I loved The Little Prince and I still read it. Nancy was a constant companion (even the ones where she drove the roadster that I inherited from my mother) my niece got the whole collection and she thought everyone had lost their mind - no horses! Kid books were often sad back in the day--well not so much little kid books but older kid books. Old Yeller ( I STILL won't read that again) comes to mind. Even my beloved Little Prince. In some strange ways it helped me adapt to life's blows when beloved animals died. Not sure what the connection was there, but hey--it worked for me. I too was a fan of the Secret Garden and Emily's Runaway Imagination (that is probably way out of print - as it was definitely not politically correct, although in its time, it was probably mainstream). Then there were the Five Little Peppers - talk about depressing! I re-read it when I found a vintage copy and thought REALLY? The Engine That Could was a children's book about a little train that tried again and again until the train succeeded in achieving its goal. It resonated with me because I had to learn everything again after being sick (spinal meningitis) as a very young child in the days BEFORE the meningitis vaccine existed. Another favorite was the Winnie the Pooh series. There were a few books that I loved in my 20s that no longer appeal to me. Cannot recall the titles, though. Chris Colfer's novels are on my TBR list. I think he is also an actor who was on the Glee tv series. Not sure if Kiddo is old enough to watch Glee. I love all the interesting discussions that pop up on Reds. I loved many many of the books that have been referenced here, Wrinkle in Time and Alexander to name just two. I've shared nearly all of my favorites with my children, who are now grown and can carry the tradition forward or not as they see fit. What I find fascinating is how the book changes as I change. There are a number of books that I loved that I reread now and wonder how I missed the messaging around roles or gender or possibilities (or lack thereof) at the time. The wonderful news is that the current read doesn't invalidate the past read. At each reading, I take something different from the experience and each of those things is valuable in its context. I used to love Moonraker's Bride by Madeline Brent. It is a very romance-y, gothic sort of book set in the time of the Chinese boxer rebellion. The protagonist is a young British woman raised in Chinese mission orphanage who has many adventures on the way to being appropriately married to the rogue with a heart of gold. Reading it as an adult, I find myself mired in the morass of culture and gender messages that make me a little crazy. Reading it in my younger days, I was thrilled with a story about a young woman who was outrageously competent (and how that competence was derided in "polite society")and somewhat fearless. Don't we all want to be fearless when entering adolescence? After the first read, I was so entranced with the setting that I went burrowing into other stories about that time period in China and the complex reality of the British presence there. Rereading them as an adult, I found myself wondering about the social constructs in England. The best thing about reading at any age - the excuse to read more! I loved A Wrinkle in Time. Our teacher read it aloud to my sixth grade class and I couldn't wait for the next day to see what happened. Of course, I was already an enthusiastic reader, but I think that book was the first time I ever felt it was okay to be the weird kid. Does it hold up? I couldn't find my copy, although I have every other L'Engle book. I read the first section of The Wind in the Door, the next book in the series, and I loved it. Wonderful, natural dialogue, and the juxtaposition of the extraordinary on the ordinary that L'Engle did so well. I read Nancy, of course, the original versions that were already very dated by the time I read them in the sixties, but to me that was part of the charm. I bought some of the "updated" ones for my daughter and they were truly dreadful. Other childhood favorites; Winnie the Pooh, Robert Louis Stevenson, Kipling (especially Kim), Louisa May Alcott (I preferred Little Men to Little Women), C.S. Lewis, The Little Prince, The Secret Garden. I didn't read Anne of Green Gables until I was in my twenties, and then devoured all the books. Oh, and everything by Walter Farley (The Black Stallion.) I doubt they hold up very well by literary standards but I don't care. And everything by Marguerite Henry, (King of the Wind, Misty of Chincoteague. Oh right! Old Yeller--way too sad! And yes so fascinating how WE change and though the words in the books are exactly the same, our changes make them different sometimes. Anyone anyone Many Moons? It is about a little princess who is smarter than her father. :-). Sort of. Oh rats--I don't think I read the Five Little Peppers-- what's it about? And of course-- I think I can ! I will admit I still think about that... :-). Are you talking about the Nancy Drew books from the 1930s or the 1960s? The copies I have are from the 1960s, I think. The styles look like they are from the early 1960s or late 1950s with the styles from that era. p.s. I still like the Nancy Drew books. Diana, I read the books from the 30s. My daughter was born in '83 so not sure when the updates I bought for her (would have been about 1990) were published, but they were truly awful. Yes, the 30s books have things in them that we would not consider politically correct, but shouldn't that be a point of discussion with your kids? I loved Dr Seuss; my mother couldn't understand why! I also enjoyed Lois Lenski (Texas Tomboy), the Secret Garden, the Mushroom Planet books. I was tickled when boy came home from school with a Mushroom Planet book. Like mother, like son. I read Toby Tyler as a kid. Hated it. So sad. Marguerite Henry was wonderful. I read Nancy Drew in the 50s and 60s before they updated them. After that, bleah. Wind in the Willows was another favorite. I'm afraid A Wrinkle in Time was after my time. Hi folks- Apologies for coming back late, I'm on West coast time. But so exciting to wake up to such a spirited debate and so many lovely comments! I'm going to print out a list of these suggestions since we're always looking for new books to read together. My kids' all time favorites so far have been all of Harry Potter (of course), The One and Only Ivan, Crenshaw (a lovely story about a boy whose family is struggling and might end up homeless again), and Wonder (the only book we've re-read together). Also, I definitely didn't mean to denigrate other writers, and I'm so sorry if that's how it came across. I approached this as more of which books don't stand the test of time, and why; and truth be told, my kids tend to remember more details from books they didn't like than they ones they did, which is funny. For me, the original Nancy Drew books were tricky upon re-reading because they focused (almost obsessively) with the physical appearance of the girls in the book. Bess is always described as "pleasantly plump" and forever on a diet, while Nancy is "slim," "lithe," etc. Seen through adult eyes, that really bothered me. Lucy asked about The Other Boy. My main character Shane is a 12yo transgender boy who transitioned years earlier with the support of his parents, then decided to keep that information private when he moved to a new city and started at a new school. But when his secret is discovered, he has to deal with both bullying and the reactions of his friends. Although there are more books out today about transgender kids, most of them focus on the transition period; and a transgender child who's very special to me complained that it was hard to find books about what came after, even though that's equally important. Btw, I'm with Hallie on The Little Princess (and my kids loved Secret Garden too). For awhile they were obsessed with Tin Tin, which has some flagrantly racist content that sparked a lot of interesting discussions. I do think that books tend to be "faster" these days in terms of action, which might have shifted their expectations. But at least with my own children, even if a book is slow, as long as it's beautifully written and the characters are compelling, they're usually game for it. Oh, and I almost forgot, Hank: I have a fantastic t-shirt of The Giving Tree looking down at the boy and saying, "Get a job." I accidentally hit Publish before I was done; I wanted to say that I loved The Five Little Peppers! Everyone's taste in books is different! MG I just burst out laughing. That tshirt is perfect!! And I think this is a fascinating and thought provoking discussion-- honest and important. Speaking of important: question for you all. My producer says she remembers her mom reading her Ring of Bright Water and loving it. Twenty five years later she went to the movie and freaked out--the otter DIES??? She said. Apparently her mother read it another way--and the otter doss not die. I couldn't help her since I never read it_ anyone know?? The Key to the Treasure and The Velvet Room were 2 books I read over and over as a child. Danny Dunn and the Homework Machine, and all the Danny Dunn books are hopelessly outdated now, but I loved to read them! Favorite childhood book, then and now. Eloise. My husband says this gives him pause. And also gives him some clues as to what sort of child I was. I loved reading Enid Blyton as a child - Famous Five, Secret Seven and I think back to reading those adventures with great fondness. My favourite books were about Pippi Longstocking, and everything by Astrid Lindgren. These are the books I still love to read every now and then. Just open it somewhere and it transports me into the story, as it did many years before. I also loved to read Greek and Roman Mythology. I also liked children's books from the past and didn't mind if they were dated. Maybe as a girl born in the sixties, I was closer to this slower rhythm of storytelling. MG I am still laughing about the tshirt. I would get it for Molly but I am worried she'd cry! Great Brain were these fabulous books set in Utah in the early 1900s with kind of a boy Sherlock/con man. His brother narrates, and (at least to my memory) they were really wonderful books with great plots that also had messages tucked away inside. I love talking about children's books, and if I were a serious rare book collector, children's books would be my choice. I do have a few older copies of some classics, such as Annie Fellows Johnston's The Little Colonel and The Gate of the Giant Scissors. I also have a copy of The Little Colonel from the late 50s or early 60s that was a birthday present to me. These books, written in the late 1800s and early 1900s were still riding the popularity of the Shirley Temple movies of The Little Colonel series. The movies were a bit before my time, being born in 1954, but they were still a fond memory for parents and grandparents then. The latter 50s and the 60s wasn't a particularly boon for children's literature, but there are favorites that I remember. It seems there was more of a reliance on older classics than new titles, but still some good reading. I still have my 1957 copy of The Christopher Robin Storybook. Rebeca of Sonnybrook Farm and Pollyanna were favorites. Beautiful Joe by Marshall Saunders is another book written way before my time, but recirculated during my childhood. It is a book based on the story of a real dog, and it is heartbreaking and heartwarming, and I loved it. The Incredible Journey was another favorite animal book. There was, of course, a much enjoyed presence of Nancy Drew in my childhood, but there was also Trixie Belden, girl detective series written by various authors (like Nancy Drew) between 1948-1986. My first book crush was Hans Brinker of the book Hans Brinker or the Silver Skates by Mary Mapes Dodge. Another recycled 1800s book, I fell in love with Hans, the selfless hero. Then, there was Homer Price by Robert McCloskey, and Homer had such great adventures, quirky people, and fun. I showed an early fondness for quirky here. Another guy I liked was Henry Huggins and his dog Ribsy, both with books, by Beverly Cleary. Henry Huggins was her first book, in 1950. And, along came Beezus and Ramona by Cleary in the mid 1950s. Oddly enough, I didn't read some of my favorite children's books until I had children. Wolves of Willoughby Chase by Joan Aiken, Harriet the Spy by Louise Fitzghugh, Roald Dahl books (became absolute favorites as an adult), The Children of Green Knowe by Lucy M. Boston, A Wrinkly in Time by Madeleine L'Engle, The Egypt Game by Zilpha Keatley Synder, and The Chronicles of Narnia series by C.S. Lewis. Oh, and Kait and Hank, I had The Five Little Peppers and How They Grew plus Five Little Peppers in Midway. This series by Margaret Sidney is about five children and their mother who live in poverty, struggling to get by after the death of the father. I will confess that I never read the two books I have in the series, as they were indeed most depressing. However, there is a story of a family left without a husband and father that my children and I read, one that was written by Frank B. Gilbreth and Ernestine Gilbreth Carey in 1948, Cheaper by the Dozen. This novel was followed by Belles on Their Toes, and my children and I enjoyed them both. The difference in the two sets of books was humor. The Peppers had none, but the Gilbreths did. Don't confuse the book Cheaper by the Dozen with the Steve Martin movie, as the only similarity is a large family. And, just a quick mention to Golden Books, which were a staple under the Christmas tree when I was a small child. The Pokey Little Puppy, The Little Red Hen, The Little Red Caboose (hmm, "little" was a popular word), Nurse Nancy (one of my favorites), Santa's Toy Shop, Pollyanna, Huckleberry Hound Builds a House, and so many more. Thanks for visiting the Reds today, M.G., and The Other Boy sounds like an important addition to anyone's reading list. Oh, I remember those golden books! And how about the blue biographies, remember? like Dorothea Dix, Girl of the Streets. (Could that be right?) and Thomas Edison, Boy Genius. (That cannot be right.) But they were all in blue bindings, and interestingly, our school library did Not let you count them in your "who can read the most books" total. Oh! Does anyone remember the "Shoe" books - Dancing Shoes, Theater Shoes, etc.? I thought The Girl would love those when she was younger, especially since she did dance/gymnastics for so many years. I was crushed to learn they'd gone out of print. Hank, yes the father otter dies in Ring of Bright Water. I suspect this was a case of the parent reading a different ending, so as not to traumatize a child. Uh-oh. I just told Mary. She said: THAT DID NOT HAPPEN! She's about to call her mother. Mary Sutton--I just watched You've Got Mail (in my hotel room, could not resist) and those are the Meg Ryan character says those were some of her favorite books! Hank - yep, yep, yep! Meg Ryan crying in the children's section of Fox Books, telling the customer all about the books. Sigh. I don't remember the endings of any of them, though. How sad. I do remember loving Dancing Shoes and Theater Shoes. So sad they are out of print. I've never found them in a used book store, either. So many good book reminders -- Five Little Peppers reminded me of Boxcar Children, and Trip to the Mushroom Planet. I loved the Little House books, and Little Women, but didn't discover Nancy Drew until recently. The Giving Tree is sad, but Shel Silverstein's poems delight all ages. My high school students liked references to them, and to Reading Rainbow, and even the Little Engine That Could. "I think we can . . ." YA Books are some of the best reading, have to be to appeal to a very discriminating a busy audience. Mary and Hank, the Dancing Shoes, etc. books by Noel Streatfeild are still in print. My daughters had three of them. Put "Noel Streatfeild" in the search line at Barnes & Noble or the other bookseller of your choice and there they will be. The Bobbsey Twins. WHAT was I thinking? I tried rereading one as an adult. The syrupy sweetness! The dreadful dialogue! The ludicrous situations! In one book the kids burn down the barn (IIRC) and what do the parents do? Treat them to ice cream! I don't quite remember the steps to reach that point, but are you KIDDING me? Also, King Quincy and the Candy Canes. I remembered the pivotal plot point (how candy canes were invented by accident and everyone ate too many and got sick so the king decreed they could only be eaten once a year at Christmas. How cute, right? Except the book is riddled with the most horrific gender stereotyping EVER. If I had had girls, I would never have let it into my house. But books that have held up: Tatsinda by Elizabeth Enright. And I'm sorry, Hank, but I still like A Wrinkle in Time. :) (The sequels, not so much.) The Phantom Tollbooth. Charlie and the Chocolate Factory. James and the Giant Peach. Harriet the Spy. The Black Cauldron. But my absolute favorite, the book that inspired me, and made me believe that I could imagine anything and accomplish anything: The Wonderful Flight to the Mushroom Planet by Eleanor Cameron. I love love love this book. My sons love this book. It was written in the 1950s, when girls were supposed to be quiet and obedient, so the heroes are boys. But that wasn't an obstacle for my imagination. When I grew up the heroes of ALL the good adventure books were boys. So I learned to deal--and to start writing my own adventure stories. Wow, so many classic children's book titles that I should have remembered in my very early morning post. Yes, I also loved reading Charlotte's Web, Secret Garden, almost all the Dr. Seuss' books, CS Lewis' Lion, Witch and the Wardrobe, as well as the Grimm and Hans Christian Anderson books. I don't think there were a lot of YA books for me to transition to in the 1970s so I jumped straight to the Golden Age mystery authors such as Christie, Allingham, Sayers and Tey, Sherlock Holmes from the age of 11-12. I have not read very many of the contemporary titles listed above...I think I missed out! Thanks, Kathy Reel! Someone must have brought them back because they were gone the last time I looked. And those are new covers. Oh I love Wrinkle inTime, Alice! One of my all time favorites--and still is! Where would I be without Meg?? I didn't get to Narnia, Grace, until j was in college--but lived most of them! I'm going to have to pick up The Wonderful Flight to the Mushroom Planet and The Five Little Peppers. I loved the Bobbsey twins too, Alice, although I'm not surprised to hear they don't hold up. One of my kids found the Boxcar children at school and tore through that series. I will say that there's simply so much more being written for kids now, and so many books that really transcend age. Anything by Kate DiCamillo, for example. It's a rich time in children's literature, and I think we largely have J K Rowling to thank for that. I will say that at age 11 I was reading HP Lovecraft and he has held up--if one can deal with him being a bigoted git and let oneself focus on his mastery of psychological horror. Alice in Wonderland scared the pants off me when I was a kid, and not too much scared me - I built a raft and floated it in an actual river imitating Huck Finn so I was both brave and dumb - but something about that rabbit hole! Of course when I got to college, I loved the book and still own the Illustrated Alice I bought then. Cheaper by the Dozen, wow. I haven't thought of that book in years. I went to school in the town the book was set in (Upper Montclair) and Ernestine came to our school to talk. She was just as delightfully funny in real life as her writing. I always did want to know the math trick. Nancy Drew IS so awkward re-reading it. And yes, awkward is the perfect word. But also--of another time . And it was so formative--and it's interesting to realize, in a good way. Charlotte's Web, Stuart Little, Mary Poppins, The Little House, The Little house on the Prairie (sort of). I was born in Manhattan and Stuart Little's adventures were perfect for my fantasies. Mary Poppins was the nanny I wished I had, The Little House was a wonderful story about the growth of cities and the ideal of the unspoiled countryside (we didn't know about suburbs then), Little House on the Prairie was about a girl's gumption and pure adventure although I expect if I read it now, there might be questionable perspectives on Native Americans. Charlotte's Web is a cheat - it was written by my beloved E.B. White after my own childhood. But for years I couldn't read the ending to my kids without choking up! Charlotte's Web still has one of my all time favorite opening lines, "Papa, where you going with that ax?" Yes--BEST first line ever. SO perfect. I still cold not rad that book without choking up, Susan. SO SAD. The blue biographies-- I think those are some of the ones I read. I read all the Shoes books. I was able to find one at a tag sale in recent years. Between yesterday's post and today's, I've been reminiscing about how I discovered favorite books as a child. Although I was very shy, I tagged along after the librarian in the children's section of the bookmobile, and asked her for suggestions, but I also was fortunate enough to have older kids who were also at the bookmobile recommend their own favorite books. As a 3rd & 4th grader, I read the 30's versions on Nancy Drew because my Aunt had saved them. Then Ireadthe dancing shoes series, books by Eleanor Estes like "Ginger Pye" and the Roller Skate series. By 5th grade I moved on to Mary Roberts Rhinehart mysteries and jeopardy romances by Mary Stuart and Victoria Holt. I blame the latter for my penchant for travel. Ah, but 7th grade was the year of years: one of my friends pulled her mother's copy of "Peyton Place" from the waste can. We had to set up a reading roster to meet the demand to borrow. One little weasel rattled to the nuns but we held fast and none of us broke the code of silence! Sigh, Those were the days! I read Half Magic by Edgar Eager at 10, and it's one of the few kids' books I still reread. I liked some of his others as well. The Black Stallion books, and Albert Payson Terhune's collie books. Mara, Daughter of the Nile was a big favorite in 6th grade. But that's also when I started reading adult books, and pretty much didn't look back. I read Gone With the Wind then, and worshipped The Count of Monte Cristo. http://bit.ly/29LD0zV Thought you would find this review by Patrick Rothfuss of a Roald Dahl story interesting, as he is not quite so enamored, and does some clever editing while reading to his son, who is a bit more clever. All the Heinlein science fiction for children. I could not believe that Podkane died in Podkane of Mars. I remember re-reading the chapter and bursting into tears. I Loved all of the Black Stallion, and Albert Peyson Terhune. Around 6th grade I was allowed into the Adult room and never looked back. I remember my first adult novel, Jeb Stuart of Candlemas Bay. Yves! Hurray. Yes, Edward Eager is the BEST. Heinlein for children? I had no idea! Looking this up right now..
And off to look for the Dahl review..thank you! Ann in Rochester--I just saw your post! "Say more of the pretty words"? Oh, I LOVE that! I am just reading all of thee again to make sureI see them all..and I just read DANNY DUNN AND THE HOMEWORK MACHINE! Wow--I haven't thought about that for years and years…loved it! Thank you, Pauline! ANd thank you ALL for being here today--hurray. Such a great discussion. Tomorrow--a trip to a weird place I had never heard of! AND THE WINNER of SAY NO MORE from yesterday IS: SUSAN in Williamsburg! My favourites were The Heidi books by Joanna Spyri and Charles Tritten, and a couple by Kate Seredy, The Singing Tree and the Chestry Oak. I read Enid Blyton and Biggles and anything I could get my hands on, including English school stories. I also love the Silver Brumby by Elyne Mitchell, and the Billabong series which my mother passed on to me from her childhood, but you probably only read those iif you grew up in Australia. Thanks, everyone, this was so much fun! A particular thanks to Hank for hosting. I really appreciate all the fantastic recommendations that will be added to my TBR pile!!! Thank you, Pauline Dudley, for mentioning The Velvet Room. Zilpha Keatley Snyder was one of my favorite authors well into adulthood. My mom brought A Season of Ponies home to me one summer when I had a cold, and I got completely hooked on it. I still have a whole shelf full of her books and--thanks to the internet--was finally able to write a long-overdue fan letter to her in 2008, to which she responded most graciously. I loved The Egypt Game, The Changeling, The Truth About Stone Hollow, and many more of her books. I was also a huge fan of Lloyd Alexander's Chronicles of Prydain. In fact, my sister and I joke about how we grew up in Prydain, saving our allowances and buying each book in hardcover as it came out. She had children of her own, so she got that set of books, but that was okay, because I bought a set of my own. Also a big fan of Susan Cooper's The Dark is Rising series, steeped as they are in British myth and folklore. I've read many of these again as an adult, and still love them all. The Witch of Blackbird Pond, Prudence...the historical Puritan YA romantic fiction certainly appealed to me. Ghost of Dibble Hollow...Scholastic classic, Vinegar Boy. Anyone remember these? Wow! The 1930s Nancy Drew books were very different from the Nancy Drew Books that I received as a birthday gift from my Grandfather. I think my ND books were published in 1958 ? I got the impression that Nancy Drew was good at everything and that she was like Wonder Woman. Very smart. The friend who was always "5 pounds overweight". I have known real people like that who are always worried about their weight even if they did not need to. I found the books from the 1930s and I was shocked by the racism in these books. I remember my US history book in college discussed the theme of racism in literature. Someone mentioned Narnia books. I did not discover these books until college. Loved them. Same was true for Anne of Green Gables and I loved the PBS movies about Anne of Green Gables. There are so many children's books that I loved as a child, though I cannot remember the titles. Hank, I remember the Golden Books and loved them. Chiming in very late, but I can't resist a chance to talk about children's books. So many of my favorites have been mentioned: Laura Ingalls Wilder, Louisa May Alcott, Noel Streatfied, Louise Fitzhugh, Elizabeth Enright, Eleanor Estes, Lucy Maud Montgomery, Madeleine L'Engle (I loved Meet the Austins when I was younger and didn't read A Wrinkle in Time until I was older). I loved The Mixed Up Files of Mrs. Basil E. Frankweiler - the thought of running away to live in a museum was irresistible. I think all those books still hold up today. I loved Nancy Drew, too. I think the older ones held up better than the newer ones - they completely changed the stories in some of those. And there was something romantic about them being set in a different generation. I think for mysteries, though, the Trixie Belden series holds up much better over time. The characters are so well-written, especially in the original six volumes written by Julie Campbell. Hank, I agree with you about The Diamond in the Window - great book! I didn't read it until college when Jane came to speak at my Children's Lit class. I introduced it to all my younger siblings and eventually to my own children and now to my great nieces - they all loved it, so I know it stands the test of time. (It's funny that The Fledgling was the book that was a Newberry Honor Book. I read it recently and didn't think it was nearly as good as Diamond). I also like Jane's adult mystery series with Detective Homer Kelly.